Kerrville Eye Center offers a revolutionary approach to cataract surgery, Laser Cataract Surgery. It provides unmatched precision and the ability to customize the surgery to the needs of each patient that walks into our office.This procedure provides patients with better visual outcomes, as well as shorter recovery times. Traditional cataract surgery relies heavily on the doctor’s technique to access, remove, and replace the cataract. Laser Cataract Surgery uses a computer-guided laser, producing more accurate and precise procedure, thus resulting in better vision and recovery time for the patient. 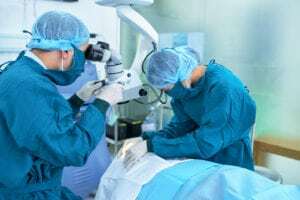 Along with better vision, Laser Cataract Surgery can also be used to treat astigmatism during surgery. Special relaxing incisions can be made in the cornea, giving it a more natural shape, improving vision and minimizing the need for glasses after cataract surgery. During cataract surgery, the surgeon can make two incisions,the capsulorhexis (incision made into the bag that holds the lens of the eye) and if applicable, limbal relaxing incisions for reducing astigmatism. Before laser-assisted cataract surgery, eye surgeons had to perform the surgery with manual hand held blades and surgical instruments. Now, surgeons can rely on the computer-guided femtosecond laser to perform these steps with precision. The femtosecond laser speeds up the procedure by only taking six seconds to perform the procedure. It dissects the cataract into smaller fragments, making it easier to be removed by the surgeon. This quick procedure makes it more comfortable for the patient, while having a faster recovery time. It is also beneficial when surgeons are performing cataract surgery on patients who have denser cataracts. What are the benefits of Laser-Cataract Surgery? Call our Kerrville office today to schedule a cataract exam to learn more about laser-assisted cataract surgery.